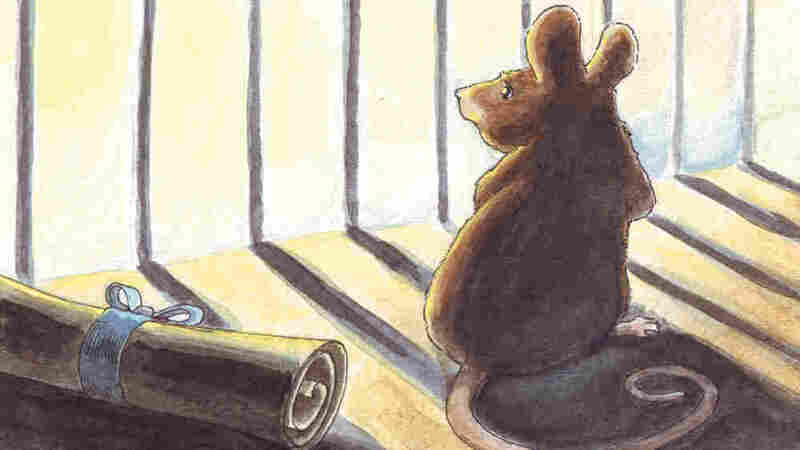 Early Animal Rights Poem Discovered: A Mouse Asks for Mercy : Krulwich Wonders... In the 1770s, a scientist named Dr. Joseph Priestley was studying mice to try to understand how animals breathe and how oxygen moved into the bloodstream. One day, he found a note, apparently penned by a mouse, wedged in the bars of the mouse's cage. He was just an ordinary mouse, nothing special. He lived, very briefly, 237 years ago, in the laboratory of a great chemist, Joseph Priestley. Here he sits, in his cage. There were lots of mice in Priestley's lab. He had made his reputation as one of the first scientists to identify oxygen. He studied mice to figure out what happens inside animals as they breathe. This meant he regularly opened them to examine lungs, veins, arteries, to see that blood changed color when it moved through lungs. And since tuberculosis — or "consumption" — was the scourge of that era, lung research seemed like a valuable thing to do. But animals didn't last long in Priestley's lab, especially mice. So many died that his lab assistant, a young woman named Anna Barbauld, decided that Priestley should give his lab animals a little more respect. It was, after all, 1773, just a few years before Lexington, Concord and the Declaration of Independence. On both sides of the Atlantic, "inalienable rights" were a rallying cry, and Anna, a young wife and poet, decided to write a protest poem. She called it "The Mouse's Petition to Dr. Priestley, Found in the Trap where he had been Confined all Night." "There's this extraordinary moment," says historian Richard Holmes. It's 1773. "Priestley packs up for the day, and he leaves that next mouse in a cage on his desk for the next morning. He will put it [in a breathing tank] and remove the oxygen, and the mouse will almost certainly die. 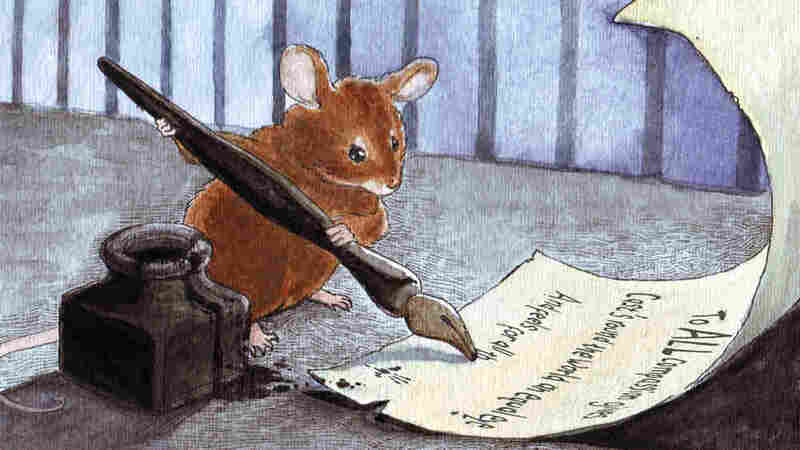 And Anna Barbauld, who's cleaning up, she just looks at the mouse, and she thinks, wait a minute, wait a minute ... and she sits down and writes a poem." Holmes says Anna folded what she wrote into a square, jammed it between the bars of the mouse's cage, and left it for Priestley. 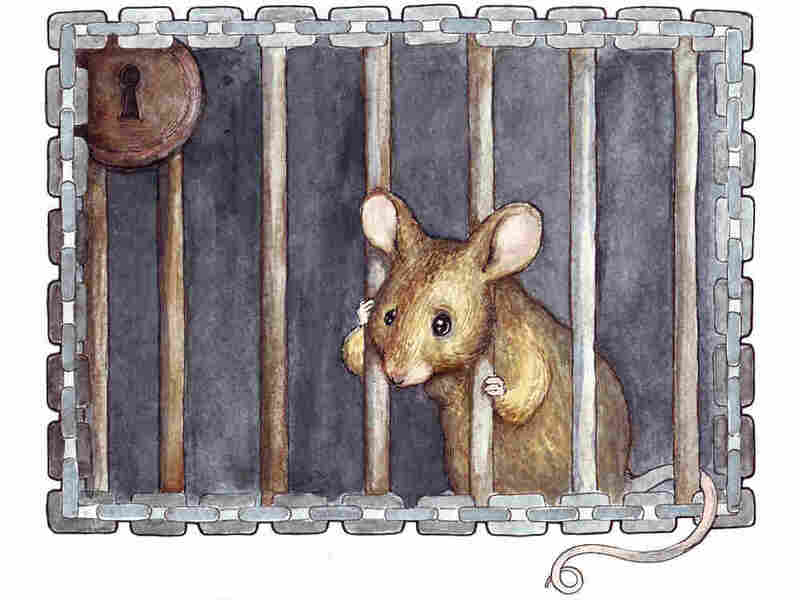 It is a poem, he says in a footnote in his prize-winning book The Age of Wonder, in which "a freeborn mouse, cruelly imprisoned in its laboratory cage, appeals for its right to life." It is written from the mouse's point of view. This is, says Holmes, "perhaps the first animal-rights manifesto ever written." The question, of course, is what happened next? 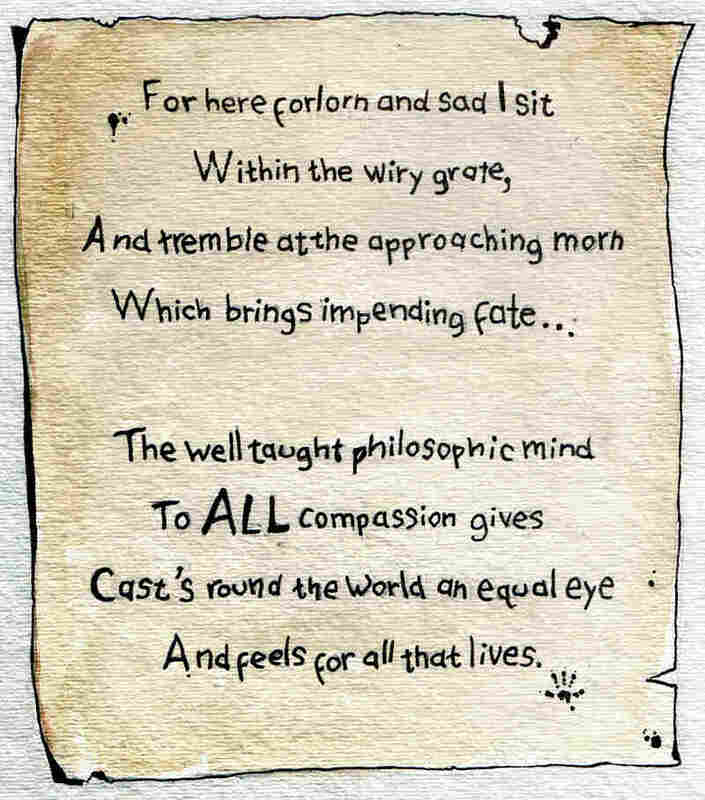 Do we know if Priestley read the poem? Do we have any idea if he spared the mouse? Holmes says it's "terribly frustrating for a biographer," but there is no evidence, no mention of the mouse anywhere that he can find. This mouse may one day become a poster mouse for animal rights, being the first little mammal to be celebrated in this way. But its fate, alas, is unknown. Special thanks to Benjamin Arthur for imagining Anna Barbauld's mouse in watercolor, and to actress Anne Bobby for her performance (including her outburst in our studio — you can hear her losing it on our radio story, and her obviously broken heart is on display; just hit the "listen" button). Richard Holmes' book is called The Age of Wonder. It won the Critics Circle Award for Best Nonfiction 2009.